The operations of the Russian air forces differed a lot from the NATO operations we were used to. Some observations are listed here. The Russians air force, as all WarPac air forces, used 'flying days'. It means that each unit was assigned (usually) two days a week for flying. The rest of the week is used for maintenance and preparation of missions. But it must be said that when it was a flying day, they would make quite a lot of missions. Being used to NATO air forces that fly five days a week, and unaware of the flying days, spotters often sat frustrated at airfields waiting for flying activities. But we learned quickly. The rumor was that the initial list of flying days was given to some spotters by Dutch intelligence. A possible explanation for the use of flying days was that East Germany was so stuffed with aircraft and helicopters, that it would be impossible to have all units flying every day. But the concept of flying days is also used in other, less-crowded WarPac countries. 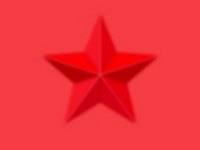 Sudden action at Demmin-Tutow! Finding a good vantage point was difficult, so the rental was used for some off-road work. The insects (especially horse flies) made it a painful affair however. Photo by Lindsay Peacock. 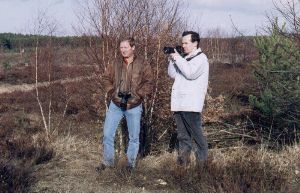 The glamorous life of aircraft spotters, Darryl Tooth and Nick Dolphin being shown here. It involves good navigation to find these obscure spots, and some guts, since this spot at Templin most likely was inside the base perimeter. Photo by Lindsay Peacock. Flying operations were performed from a flightline. At the start of a flying day, the aircraft were towed from the shelters to the flightline. There were no specialised tow tractors for this purpose; the towing was done with all kinds of trucks. Each aircraft had its own towing bar, on which the boarding ladder and a tool box could be attached. The aircraft code was painted on things like engine covers, so nothing could be mixed up. The end result, a flightline full of aircraft, surely was an impressive sight. Before the operational flying started, a weather flight was sent out. Usually a two-seater was used for this. On days with nice weather this is a bit of a joke, and we sometimes saw the pilot just play around and make high speed fly-bys. I asked people who worked in RNLAF in the fifties, and they told me they used to have a weather flight too. But this practise is long been abolished in the west. One evening at Jüterbog, a large number of Mi 8's, Mi 17's and Mi 24's just flew in a big circle, practising approaches. It looked rather silly. 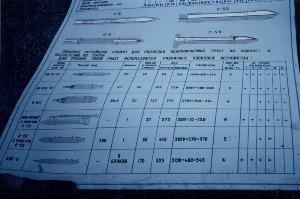 At Osla (Poland) we saw MiG 25R's al flying exactly the same pattern after take-off, and again when returning. At Zerbst, we observed MiG 29's making very short missions. All the Fulcrum-A's made 10 minutes long missions, while the Fulcrum-C's made 20 minutes missions. It was like watching RAF Lightnings! Another nice example was observed at Brand, a MiG 27 base. Four Floggers took off, and one spotter decided to follow them as long as he could using his 20 times binoculars. The weather was very nice, and he could follow them for a long time, flying west towards Jüterbog. Just at the point he feared losing them, they made a turn north and started diving. They disappeared behind the horizon, but a little later they appeared again. Clearly they were using a bombing range, each making a single dive attack. After that they returned to Brand. The whole mission was thus observed visually! From Lutz Freundt's third book we now know the bombing range involved was called 'Heidehof', a large area of roughly 22 by 6 kilometers between Jüterbog, Luckenwalde and Baruth. The distance from Brand air base to the center of the bombing range is just a mere 30 kilometers! The traffic patterns used by the Russians were also different. In good or fair weather, NATO pilots use a rather thight circuit (initial, downwind, base turn, base leg), or a ground-controlled straight-in during bad weather. I've seen the Russians only fly one type of pattern, which was quite wide. The following sketch is based on information provided by a German enthusiast. At Finow a Russian alternative for a wind sock was seen. Four oildrums filled with scrap wood / oil / rubber were placed along the runway, and lit. Their smoke clearly showed the wind direction to the pilots. It is not clear whether this was a standard procedure, but it surely is a simple solution, although not so environment-friendly. I have very fond memories of the few times I saw the Russians train night flying. Trucks with giant searchlights were positioned near the runway threshold, and the flooded the runway with light. Every time an aircraft took off or made a landing, these lights were switched on. The sight of a landing aircraft suddenly illuminated over the runway was incredible. Welzow during night flying operations. Photo by Lindsay Peacock. 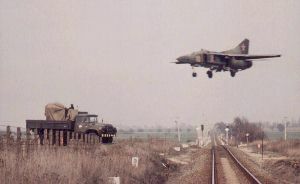 A MiG 23UB on final approach of Grossenhain, crossing a railroad track. A technician prepares one of the searchlight trucks for night flying, having just driven it into position on a concrete hardstand. Photo by Lindsay Peacock, Grossenhain, April 1992. Another noticable difference with NATO operations is that we have never observed aircraft from one air base visiting another. Possibly the bases had no cross-servicing facilities. One exception was a visit in 1990 of six East German MiG 21's to Welzow, where Su 24's were operated. On NATO airbases it's quite common to see visiting aircraft. Reasons are to get air forces acquinted with and learn from each others operations, to train ground personel in handling different aircraft (cross-servicing), and to provide dissimilar air combat training. Possibly the Russians didn't value this much. Like in the west, few weapons were carried on normal training missions. If missiles were carried by MiG 29's, it usually were short range IR missiles (or a dummy body with a seeker). I've never seen any long-range missiles on the MiG 29's. The Jüterbog MiG 23MLD's were fitted with pylons for R-73 Archer missiles. Most NATO ground attack aircraft carry some sort of practice bomb dispenser during training missions. Apparently the Russian air force doesn't use them. Rocket pods are however fitted to nearly every attack aircraft. 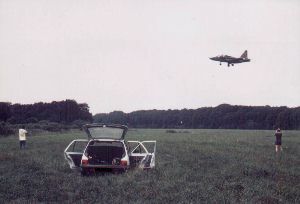 In 1990 some spotters have seen the aircraft in action at bombing ranges, and they saw (and felt!) them using live bombs and rockets. They are still impressed by what they saw there. 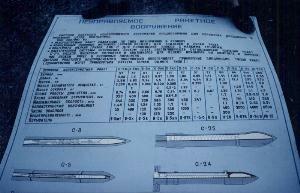 And in 1990 two Demmin Su 25 shot up a farmer's wharehouse with some type of rocket. In 1991 I saw two Brandis Su 25 taking off with Kerry missiles.